Decatur City Hall is located at 1 Gary K. Anderson Plaza, Decatur, IL 62523; phone: 217-424-2700. 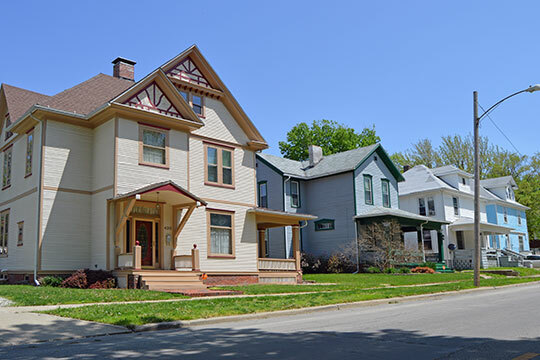 Photo: Homes along West Decatur Street, Decatur Historic District, Decatur, IL. The Historic District was listed on the National Register of Historic Places in 1976. Photographed by User:Nyttend (own work), 2014, [cc0-by-1.0 (creativecommons.org/publicdomain/zero/1.0/deed.en], via Wikimedia Commons, accessed October, 2014. Decatur, seat of Macon County, lies on a bend in the Sangamon River, which was dammed here in 1923 to form Lake Decatur. An important railroad center, Decatur is the home of the Wabash Railway's repair shops, which are the city's second largest employer. The northeast section of the city is a welter of tracks bordered by roundhouses where locomotives are periodically dismantled and refurbished, and by shops where coaches are overhauled. Near the tracks rise the buildings of Decatur's largest employer, the Staley Company, dependent on the railway to feed the maws that annually swallow 13,000 carloads of corn and soybeans. And yet Decatur is not a "factory" town, although its 12,000 workers fabricate products ranging from fly swatters to steel bridges. Neither is it essentially a college town, despite its Millikin University, nor a farm town, although it is hedged in by a limitless stretch of farms in all directions. In part it is all of these; students liven its streets and the university lends its academic dignity to the west part of the city; on Saturdays farmers descend on the city in large numbers for their weekly shopping; the fortunes of its industrial plants concern a large portion of the citizenry. Certainly Decatur is a prairie town. It rests on a long swell of the Illinois grass land, which rises gently from the Sangamon River, carries the business district on its crest, and drops again to the prairie level north of the Wabash tracts. Prairie grasses and flowers push against the doorsteps of the outermost houses, and each spring brighten the vacant lots. The swell imparts to the streets a sense of affinity with the land; the blocks of low weathered buildings seem a part of the prairie, in no way foreign to it, having the horizontal line emphasized in Frank Lloyd Wright's conception of Prairie architecture. Neon-lighted store fronts in downtown Decatur fail to hide the fact that the buildings are old; even the "new" ones, with the exception of the Citizens Bank, were built before the World War. The others date back to the nineteenth century and have been stained as much by time as by smoke. In 1829, although there were small settlements nearby, a 20-acre tract of prairie with no inhabitant, house or footpath was named Decatur and made seat of Macon County. Later in the year James Renshaw built the first cabin within the town site. In the spring of 1830, when the town consisted of a few log houses, a store, a tavern, and a courthouse, Abraham Lincoln, just twenty-one, drove through town with his family and took up residence on the Sangamon River a few miles west of town. At the home of Major Warnick, the county's first peace officer, young Lincoln pored over borrowed books; in what is now Lincoln Square he made extemporaneous public speeches; and on surrounding farms he hired out as a plow boy and rail splitter. In 1836 arrived another farm boy, Richard J. Oglesby. After spending many years of his boyhood in Decatur working at whatever job came his way, and sporadically attending country school, he went to Springfield to study law. Later he became a State senator, a United States senator, three times Governor of the State, and Major General during the Civil War. A friend of Lincoln from the time they met in Springfield, he was at the bedside of the President when he died. The wealth of Decatur until 1854 was almost entirely dependent on agriculture. But with the arrival of the railroads in that year manufacturing began; the first factories were small and mainly supplied the immediate needs of the town and neighboring countryside. Their demand for labor steadily increased the town's population and the great need for goods and farm products during the Civil War further stimulated industrial growth. From 600 in 1850 the population rose to 3,839 in 1860 and more than doubled in the next two decades. Outstanding among the men who developed local commerce and industry was James Millikin, who established the Millikin Bank and amassed a fortune, part of which later was used to endow Millikin University. In 1874 the city's economy was broadened when coal veins under the city were tapped, and with the opening of the new century the population had passed 20,000. In 1903 the university was opened, with President Theodore Roosevelt present at the dedication. Four years later the processing of corn products began here and has expanded continuously. By 1914 Decatur was among the few Illinois cities producing more than $10,000,000 of goods annually, much of which found markets in foreign countries. Through the booming twenties the city prospered. In 1923, realizing that an inadequate water-supply would soon restrict her industries and prevent the establishment of new ones, Decatur replaced its archaic little dam with the present one, which impounds enough water for a city three times its present size. In 1925, 800 new homes were built, and in 1927 almost $6,000,000 went into commercial and residential construction. The stock market crash of 1929 did not immediately affect Decatur as a whole; the year 1930 was a prosperous year for the entire county and agricultural products were valued at $11,000,000. But soon the great depression that moved across the world came to the corn belt and Decatur. Farm products fell in value; wages decreased; men were thrown out of work; for a time almost all of the major plants in the city were closed. During these years of depression Decatur experienced its first serious strike. In February, 1935, the employees of Decatur's several garment factories walked out to fight wage cuts. On several occasions pickets and police officers clashed; by October, 1937, with the issues still unsettled, many of the workers had returned to their jobs. Although in 1938 industry and farming in Macon County approached their former prosperous levels, hope for the future lay not entirely in them. Oil has been found in southern Illinois, and reports of geologists have strengthened the belief that "liquid gold" underlies western Macon County.